The MindCuber family is a group of robots, designed using LEGO MINDSTORMS, that can solve the well known Rubik's Cube puzzle. 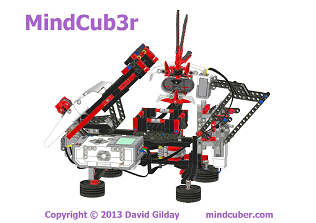 There is one variant, MindCub3r, that can be built from MINDSTORMS EV3 and two different variants of MindCuber for MINDSTORMS NXT. Each variant uses a different selection of pieces. Please select which MindCuber to build according to your EV3 or NXT kit. LEGO MINDSTORMS NXT (item 8527) - the original kit in an "Orange box"
Each of these sets contains a progammable NXT "Intelligent brick", three motors, a number of sensors and a collection of bricks, gears and other pieces. There is some variation between the sensors and pieces in each of these sets. Click here for MindCuber for NXT troubleshooting tips. Click here for MindCuber for NXT program source code. 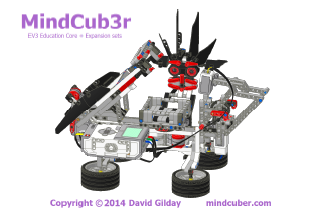 Follow MindCuber's creator on Twitter @DavidGilday to be kept informed of updates.